Find out how easy it is to perform Pioneer Drama Service's plays and musicals! We can save you both time and money! The more you know all the ins and outs of our policies and rules, the more you'll be able to take advantage of them! At Pioneer Drama Service, it's our customers, not our plays, that are key to our business success. Pioneer Drama's values permeate every aspect of our business, creating long-term partnerships with teachers and directors. Learn more about us and how we're here to help you! Electronic preview scripts are great, but if you're perusing a musical, you also need to hear the music, right? Problem solved! Now, whenever you download a musical to your Pioneer library, you automatically also get the music sampler for the show. Already have musicals in your library? No worries! Your library has been upgraded automatically so even musicals that were previously in your library now have a music sampler. Our music sampler for each show is the exact track off our CD Samplers. This means you get to hear about a verse and a chorus of every single song in the show along with a little narration to follow the storyline of the musical. Better yet, it gives you a good chance to hear the quality and tempo of our prerecorded music as well as judge whether the vocal range will fit your students. Steve and I just got back from another conference, this one in Minneapolis. As much as we love meeting teachers and hearing about their needs, we spend just as much time talking with other vendors, including other publishers. So I'm shocked—and dismayed—to find yet another play publisher charging for video rights. That's ridiculous! At Pioneer Drama Service, we never charge you extra to allow parents to videotape their kids and post it on Facebook or YouTube. In fact, we encourage it! Face it—with video cameras no bigger than an iPhone, how are you going to stop them? And why risk an infringement penalty from Samuel French, MTI, Heuer, and now Theatrefolk just because some proud parent wants to record his kid's Oscar-worthy performance for Grandpa and Grandma in Sarasota? At Pioneer Drama, we're parents, too, so we get it. We never charge you extra for parents to videotape their kids, and we ENCOURAGE posting on Facebook and YouTube. After all, that's what we do at our kids' performances. One afternoon, a visiting high school theatre director was in our light booth with my colleague, Katie. It was not quite time for rehearsal, but the company was already warming up on the stage. “What is going on down there?” our visitor asked. Katie explained warm-ups. “But their director is not here yet!” the visitor exclaimed. “She doesn’t have to be. The company is responsible for warm-ups.” Katie replied. Granted, our small college prep school in Athens, Georgia, is a unique place with a clearly identified set of values. Ensemble, leadership, integrity and pride are more than just ideals; they live and breathe. I certainly have no incantation, formula, or checklist guaranteeing others the creation of a successful ensemble. All I can do is share with you my observations and my practice, but I know it has more to do with the values you teach and instill in your students than anything else. If an open, accepting, ensemble based program is desired, it starts with the teacher/director. The adult leader is the ultimate example for behavior, respect, work ethic, expectation and attitude. The leader sets the tone by his/her words AND actions. You cannot ask from others what you are unwilling or unable to give yourself. The teacher/director should strive to be organized, respectful, punctual and efficient with time. Do not underestimate the power of example. 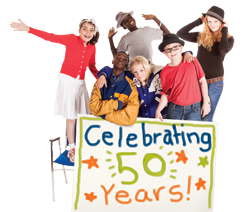 This year beckons in our golden anniversary, and I�m proud to say that Pioneer Drama celebrates turning 50 years old by finding new ways to improve. I remember when my parents first started Pioneer Drama Service as I was growing up in Cody, Wyoming. I would sit on the living room floor and put address stickers on catalogs by hand. (California took hours!) Pioneer Drama Service has come a long way since then. In the last 10 years alone, we’ve sent out over two million catalogs. From our roots in community theatre to now being one of the premiere publishers for educational and children’s theatre, we’re constantly evolving to keep up with the times. This year beckons in our golden anniversary, and I’m proud to say that Pioneer Drama celebrates turning 50 years old by finding new ways to improve. You've asked for it, so we've delivered! With just a click of a mouse on any one of our more than 925 shows online, you can now instantly see about a third of the script... at no charge. This script sample includes the complete cast list, set description and production notes, plus many pages of the actual script so you can "try it before you buy it." We know your budget dollars are precious and few, and we're all about helping you make these dollars stretch as far as possible. With free script samples online, you can make sure that even the preview copies you buy are right on target for your group. But we don't stop there! Read on to learn what else is new at PioneerDrama.com. Have questions? We are here to answer them! Summer is a great time to contact us. Call us! We love talking to customers. Our toll-free number is 800-333-7262. Live Chat. Look in the lower right corner of our website for the chat link. Just click and a customer service representative will respond. You can also email us anytime by using this link http://www.pioneerdrama.com/ContactList.asp Select a subject from the drop-down menu and your email will go to the right person. However you do it, we are happy to assist you and now is a great time. It’s that easy!